Creating a consistent flow of targeted and helpful content is a proven way to attract qualified leads through your website. It can be a time consuming task to keep your editorial calendar filled with this type of content, especially if you’re a small marketing team. If you can relate to this, then a content curation strategy could be a good fit for you. Here are three strategies that you can add to your inbound marketing mix today. Implementing these tactics will help you create more content, become more well-read on industry topics, and provide opportunities to repurpose and re-share your existing content. If you come across a thought provoking article, there is an opportunity to share it with your blog audience. Here you’re working off of the original thought as expressed by the original author and adding your unique perspective. This strategy gives you the opportunity to bring outside industry content and apply your unique industry perspective to the thoughts. Ethical curators don’t just summarize or regurgitate pieces from other sources. They explain why it matters, how it impacts readers, or what may happen in the future. Adding this human element is a great way to work your voice into the conversation and incorporate brand-appropriate keywords that may not have appeared in the original piece. In addition, make sure your commentary is longer and more detailed than any sections you’re quoting. For example, lets say that you manage a shipping and logistics blog that is read by a lot of people that manage teams of people. One day you read an interesting article about work place productivity at an startup tech company in San Francisco. The article talks about how their teams became more efficient by working at shared desks instead of cubicles. They saw a big increase in productivity and customer satisfaction because team members were communicating more face-to-face. You think that your readers may be interested in the article and implementing a similar strategy in their workspaces. By taking a quote or two from the tech article and adding industry expertise and understanding, you can provide your readers with a handy resource to help them better manage their people. 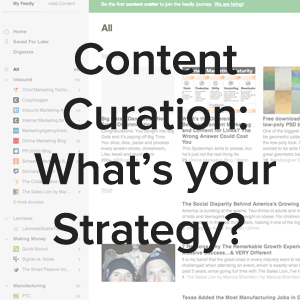 A common example of content curation is a round-up post. Curated round-up posts are a collection of 4 or 5 industry relevant articles. Here you find an interesting article, select a paragraph of interesting content, link the title of the article, and maybe add a few thoughts about why you found the post helpful. Blogging remains one of the most important ways to educate prospects and drive traffic to your website. Curation software and distribution tools can typically make this process more achievable for those with less time and resources. Although tools can make the creation and distribution process much easier, however, you’ll still need to have a good idea of what type of blog to create, and when to do so. This strategy is a creative way to reengage your list members and bring them back to your website. You can do it in two ways. You can send a weekly email that links to your round-up blog post, like we just talked about in the last section. It is also a good way to share the top performing articles from your blog. In the second example, you simply need to check into your analytics to see which posts had the most visitors and the longest time on page. These two metrics will help you gage how engaged the readers were with the posts. If other readers found them engaging, chances are that you list members will find them engaging as well! Content curation is a great way to augment your editorial calendar and repurpose your existing content. If you’re interested in learning more tips and tricks about content creation, check out The Ultimate Guide to Epic Content for Boring Industries. This free eBook is packed to full of helpful tips and tricks to help you create truly epic content regardless of your industry.